Purple-streaked, lavender, funnel-shaped flowers cluster in terminal spikes that flower bottom up. Pretty isn't she~~ With a mouth full of a name~~Physostegia virginiana! People love the flower, but often not its enthusiasm in good garden soil. Shown above with Tartar Aster~~they can duke it out! It's a gorgeous sight when the asters and False Dragonhead bloom together. A lovely native to TN (and a good portion of North America) it blooms early in September. Bumbles love this flower; crawling completely into the big tubular flowers. No doubt attracted by the bright nectar lines on each flower. A beautiful colored plant sucking creature. A flower here and there is a pleasant sight. I love them as companion to the Susans. Learning to mass plants~~we've got that trick down pat with the Susans! Let's hope we can generalize this skill to other plantings! Have a delicious day! I'm going to be off line this morning~~My ISP will be here repairing our wireless connection...So, I'll be seeing you all later. Those long-legged beauties look so striking in your garden. Sounds like they are drama queens! Diana, I love that~leggy beauties! ...you can grow them in TX! Dee, Your soil is probably much nicer then mine! I do find that they pull out easily here. That first shot of the purple against the gold made me gasp with delight. Very nice Gail! Are they from seed or plants? Just gorgeous. I love to see plants 'duke' it out for soil. Mass planting is something I like to see. There are plants that I still miss having in my garden; species that grew in Chicago but cannot be grown in California. You've reminded me that Physostegia is one of them! I grew P 'Variegata' and loved its blooms! One of the best things about blogging, besides from the great people, is seeing new to me plants. I love these colorful purple beauties. One thing you won't have to worry about is the Obedient plant not massing. I dare say it will bully itself into the susan area in no time. It is a brute once established. Those delicate looking blooms are just a decoy of the fact they are a tough tenacious plant. Love seeing that little harlequin bug. They are a lovely colour - I like their spikiness and the way they open from the bottom up. Hope all goes well with your wireless connection! Hmmmm...I think I have/had some Physostegias around here. Must go look. Great photos as always, Gail. I used to grow it and really like it. Somehow when I moved my flower beds, that one didn't get brought out front. Lots of gardeners are paranoid about the way it spreads. Guess it needs a naturalized setting or at least careful siting so it doesn't take over a small garden. Obedient Plant does have beautiful flowers. I have it naturalized in a few places and dry conditions keep it in check. I love how it looks with the Tartar Aster next to your house. OMG, I need, need, need to get this!!! There are so many lovely dracocephalums. I need them all! 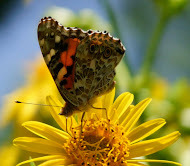 Hi Gail, your photos are just amazing! You have showcased a sometimes snubbed plant so well. I have even snubbed it myself until you gave me some last year. Learning to mass those plantings, why is it so hard to do? Those darn harlquin bugs have been very naughty in my garden this year too. Even after I have tried to be a nice live and let live gal, I am now squishing them for the death and destruction they have brought. They got onto the dahlias and that was the last straw! I don't have the purple one here at my garden but hope to soon. I did purchase 'Miss Manners', a white cultivar. I just dug all 6 up because they were not performing well. Such a shame too as these are most pretty when in bloom. I planted a 4 inch pot of 'Miss Manners' obedient plant this spring. This white-flowered version of physostegia is supposed to have - ahem - better manners in good soil than the original. Will see how it goes and report in a year or few. Great colors. Fall does have so many lovely colors to us to enjoy. Gail, I'm so funny! My first thought was, wow that plant is just eerily similar to obedient plant, right down to the color, the way its blooms open, and the fact that bees LOVE it. A quick Google of its Latin name later, and, DUH!, it IS obedient plant. I love blogs because it's fun to learn the different common names. :) I have a huge, HUGE cultivar of Physostegia virginiana in bloom now. It's one of the things I'm dividing later this fall in my huge gardening chess project. Looks like you've got a good start on a mass planting here, Gail. Anything that blooms in September sounds good to me! I've never seen a harlequin bug before; what a cutie! 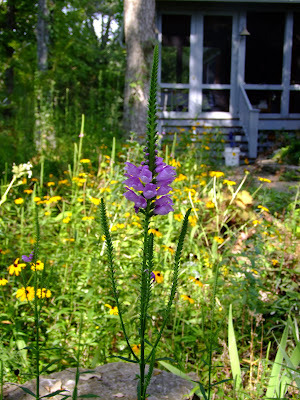 Whoa, I just read Monica's comment--I had no idea this was also called an obedient plant! If that's so, then I have one,too! Mine isn't blooming yet; in fact, it was broken off by a strong wind (or rambunctious Golden Retriever), but then I noticed the other day that it has sent up a second stalk. It must be one tough plant! Hi folks~~Rose and Monica~~It is an obedient plant, but, that's not the name that I was introduced to when I was given this plant about 18 years ago! So DAVE the original plant came from a start, but I will collect seeds for you. FRances, It's a worth while plant...I think in our dryer soils it won't get too out of hand! Our Friend Ben, I am also a two fingered typist...but the thumb got injured from playing Freecell! Lisa, It hasn't gotten to bad here~The soil is bone dry during the summer and it can't spread far! I wonder what it would be like to have loamy, clay soil with good drainage! Jen, When I looked on the map...Your part of NA was one of the areas that False Dragonhead plant didn't grow! I would think it would be very happy there! I wouldn't plant it your garden...it might like your great soil. really gorgeous native. i agree they would be quite a sight en mass. i really like the dark green foliage next to the lavender. it is always a process to learn what to plant, how many and when to add something. I need to learn about massing plants together too Gail. I tend to stick one or two of something in the garden just for the variety, but it doesn't create the same effect. You have certainly mastered that with the susans. I love this perennial and I thought it was supposed to be good at massing itself about? Does it have trouble doing that in your garden? Beautiful photos! Gail, I too thought it looked like the obedient plant-duh! Funny how different common names pop up in different parts of the country. I guess that is why the Latin ones. :) Yours is a lovely lavender, will have to look for that one and I want a white as well. The ones Rose and I got at the native plant sale are pink. Good luck with your mass planting-will be beautiful next to the Susans. 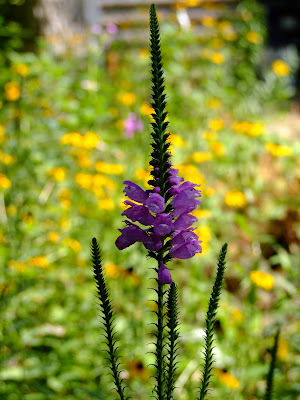 Common name: Obedient plant. Common name around these parts: DISobedient plant. It takes over in my 2 best buddies' gardens and won't survive in mine. They don't want it and can't get rid of it, and I want it but can't get it to grow. Ain't that just the way of gardening? Yours are spectacular! 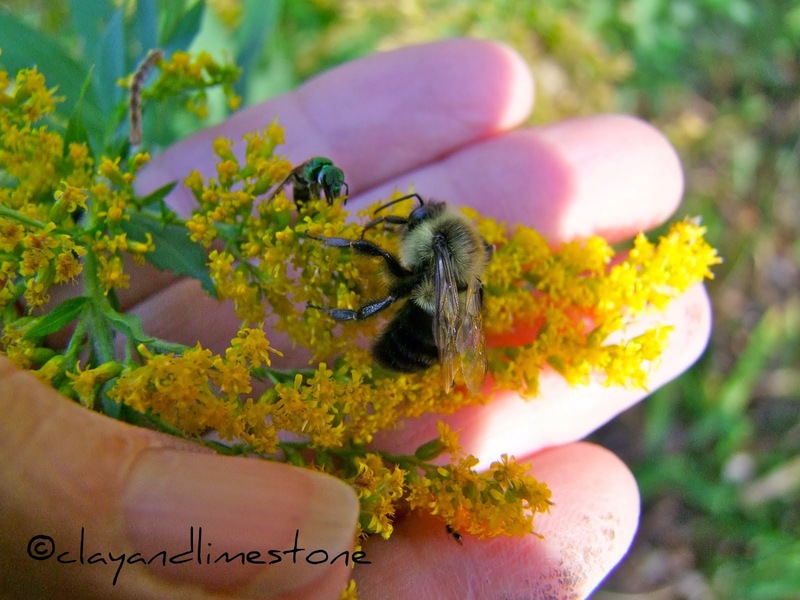 Thanks for stopping by - I'm good but working a lot when I'd rather be in the garden. That is one impressive wildflower, simply beautiful and so are your photos Gail. The Physostegias look great! Mine bloomed back in July, if you can believe that. I'm sorry they're done for the year but can't wait to see them again next year!